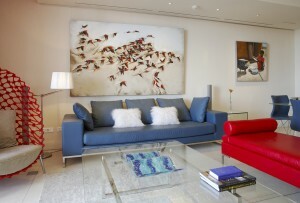 Cape Town 5 Star Luxury Accommodation in the heart of the V&A Waterfront. This extraordinary Waterfront Residence offers the best 5 star accommodation in Cape Town with a level of sophistication and style unmatched in this beautiful city. Set on the water’s edge in the heart of the Mother City’s acclaimed V&A Waterfront and rubbing shoulders with two of the world’s leading hotels, the One and Only, and the Cape Grace, Pembroke 403 is the quintessence of luxury serviced accommodation for either business or holiday. The views from this Cape Town apartment are spectacular – to the front, it overlooks the Marina with its amazing luxury yachts and playful seals, the V&A Waterfront, through the Bascule Bridge to the working harbour and beyond through the Swing Bridge towards Blouberg, Melkboss and the Atlantic Ocean. The rear balcony of this luxury Cape Town apartment looks directly to Signal Hill and Table Mountain, one of the Seven Natural Wonders of the World with or without its tablecloth. By night, you can sit on the Marina balcony and be entranced by the stars above and the myriad of twinkling lights that is all around the Waterfront. Perched above the marina on Cape Town Waterfront, relax and enjoy a drink at sunset looking out over the water or contemplate the majesty of Table Mountain after an invigorating day out and about. When only the very best will do for your Cape Town trip, why look any further? Our family has traveled to many places around the world, and Pembroke 403 was truly one of the loveliest accommodations we ever had. We thoroughly enjoyed the spacious apartment, its contemporary decor, and views of the harbor from the living room and of Table Mountain from the den. We packed a lot of activity into our short visit to Cape Town including the cable car to the top of Table Mountain, the beautiful drive to the Cape of Good Hope, and an equally scenic drive to see the whales in Hermanus. But some of our favorite moments of our visit were sipping excellent South African wine in 403 Pembroke while watching seals in the harbor, and enjoying the peace and luxury of the apartment itself. Liked best: Location, views, amenities, style and, most of all, the charming owner, Eilis! The location and accommodation cannot be faulted. You will not find a more fitting place to spend your time in Cape Town. This is an absolutely amazing apartment. It must be one of the very best apartments in Capetown. It is right on the V&A waterfront and has dual aspect, with balconies facing the sea and the Cape Grace hotel and table mountain and the One and Only Hotel, on the other side and so the views are just wonderful. It's really big and very luxuriously furnished.Everything was really top end. We stayed here in February 2013 and are already talking about a return visit. We booked directly through the owner, Eilis, who could not have been more helpful or accommodating. She answered all our questions and really wanted to ensure that our holiday in Pembroke 403 was perfect in every way. Restaurant recommendations, day trips, what not to miss, where to get the best coffee, freshly baked breads, steaks, sushi etc were all kindly offered by Eilis and we felt she took a real interest in our holiday. We loved so much about the apartment, it is hard to know where to start. The two balconies means you have sun all day and right into the evenings. Both have sun loungers and a table and chairs. I loved the bed linens which were specially commissioned from Italy and all the lovely fluffy towels in the three large bathrooms. I loved the views from both big balconies. I loved watching the seals in the bay right in front of the apartment, using the binoculars which Eilis had kindly left there for our use. I loved looking at Table mountain in all its various hues. The art work all over the apartment and the glass is just fabulous. I loved the chairs in the living room which were so comfortable. My husband loved the three gorgeous televisions with every sports channel imaginable. We both enjoyed the location. It was great to just walk over to the waterfront, and it is just a few minutes drive from all the other many Cape Town attractions. This is a big apartment.Obviously it is perfect for a large group, as it very comfortably sleeps six. I think it would be perfect for two couples who like to travel together, but also like a little privacy. Both suites are large and are at opposite ends of the apartment. The Table Mountain suite is slightly smaller, but it gets lovely afternoon and evening sun and is just so peaceful. 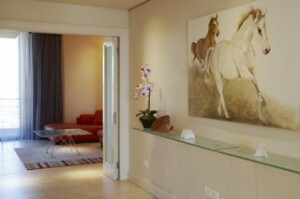 Both suites have electronic safes, which is also ideal for 2 groups. The kitchen has everything that you could ever need. We made great use of the picnic basket and cooler box on trips to Cape Point etc. Eilis is a wine expert and importer. She will also advise on trips to various vineyards etc. We had all the services of a top class hotel, but with the added benefit of complete privacy. We were met by Ozzy, who was available to us for the duration of our stay, if we needed any assistance or advice. He was super, friendly, helpful and always accommodating. Eilis even provided a mobile phone for our use which was really useful to make reservations in restaurants etc. We had a really wonderful time in Pembroke 403. If you are looking for somewhere really great to stay in while in Cape Town, stay here. We can't wait to go back! Many thanks to Eilis for all her help, enthusiasm and interest.